Make your tax deductible year-end gift today. At this special time and throughout the year, we extend our gratitude and thank you for your continued commitment and support of our students. We invite you to invest in tomorrow's leaders by making your tax deductible year-end gift today. Support UDC and make a difference! The University of the District of Columbia system, including the flagship four-year institution and the new Community College, offers more than 70 academic programs that range from the Associate degree to the Master’s degree. We also offer numerous certificate programs that assist residents of the District of Columbia in improving their lives. These programs as well as an abundant population of bright students and dedicated faculty make UDC not only unique but also critically important to the District and the region. Private funding assists the university in fulfilling its mission of providing quality, affordable, and accessible education to students in Washington, DC and beyond. Your support is critical to our success! Supporters like you help UDC meet its challenges with courage, determination and vigor. Every gift and every donor makes a difference for UDC scholars. Your gift is a meaningful way to demonstrate your support and we welcome your interest in building a public university our city can be proud of. 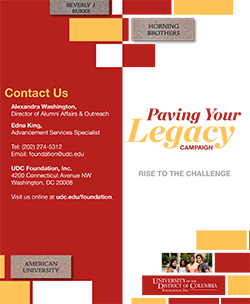 Read more to learn about the number of ways and opportunities to participate in giving programs at UDC.